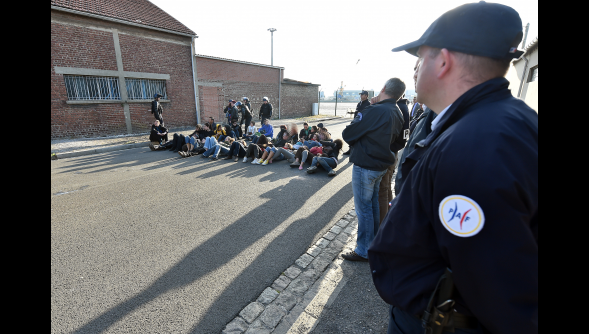 Mass evictions of over six-hundred people across Calais! At 6am this morning CRS riot cops and PAF border police accompanied by gendarmes evicted three squats – on Rue Massena, Rue de Vic et Rue Auber – which were housing over 70 people for several months. At the same time, the three police forces surrounded SALAM, a food distribution point, and violently evicted over 500 people who had moved to sleeping there since the eviction and destruction of three of their camps a month ago. All exits of the gated concrete yard of SALAM were blocked by the police and tear gas was used to prevent people from escaping. Over twenty women and ten children were sleeping at SALAM this morning when the cops came, and another hundred+ minors were swept up in the police operation during the day. All of people’s means of shelter were destroyed. 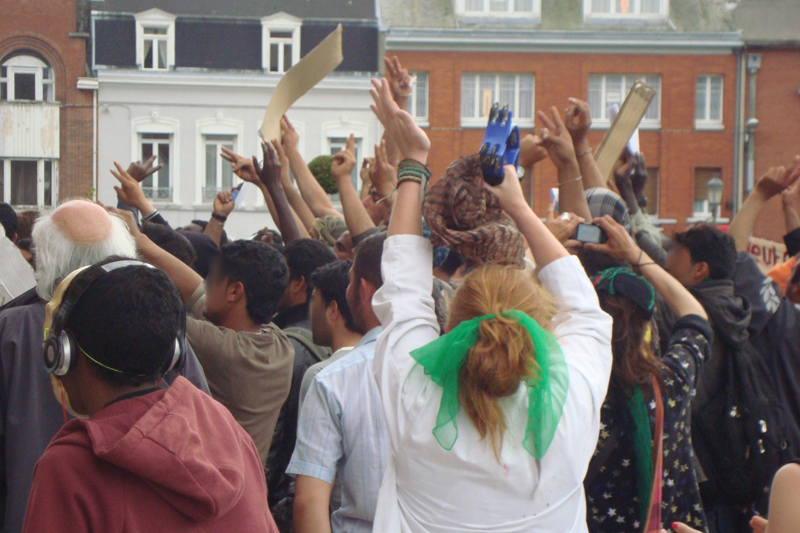 ‘Activists’, associations and journalists were quickly separated to stop people intervening or bearing witness, so the eviction could happen out of sight. 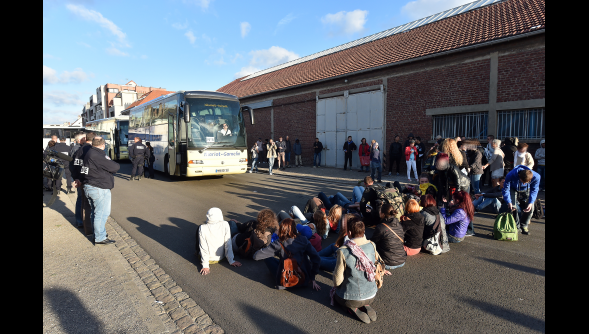 Over 300 people were rounded up and taken away by coaches to detention centres in Coquelles (in Calais), Lille–Lesquin and le Mesnil–Amelot (near Paris). 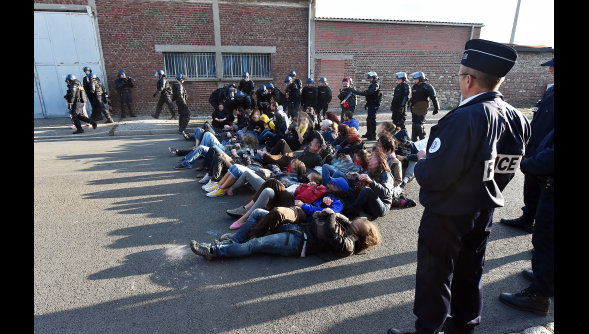 It seems many transfers of detainees across France had already been made to open up space in detention centres nearer Calais in preparation for today’s eviction. 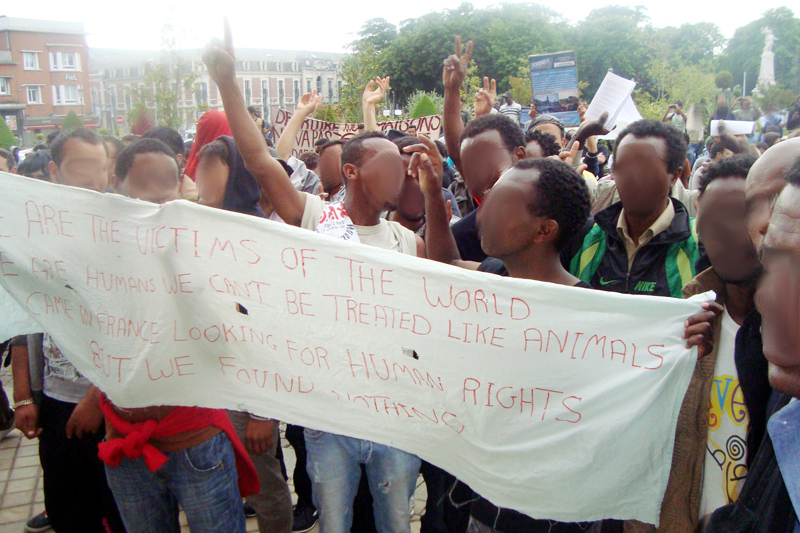 Minors (including fifty from Sudan and Eritrea) were taken to a camp in Boulogne-sur-Mer. 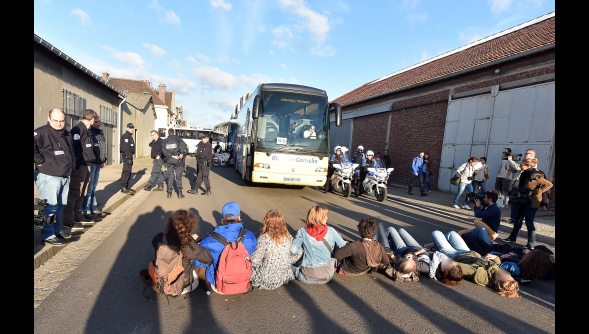 Dozens of people tried to stop the coaches taking people to the detention centres by blockading the road as the coaches were trying to exit out of SALAM. 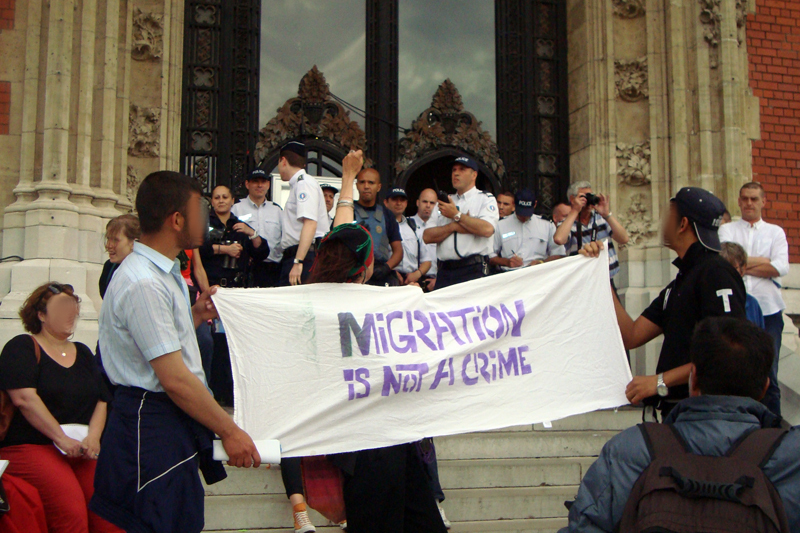 People fear these evictions will be followed by mass deportations to areas within and outside of Europe. 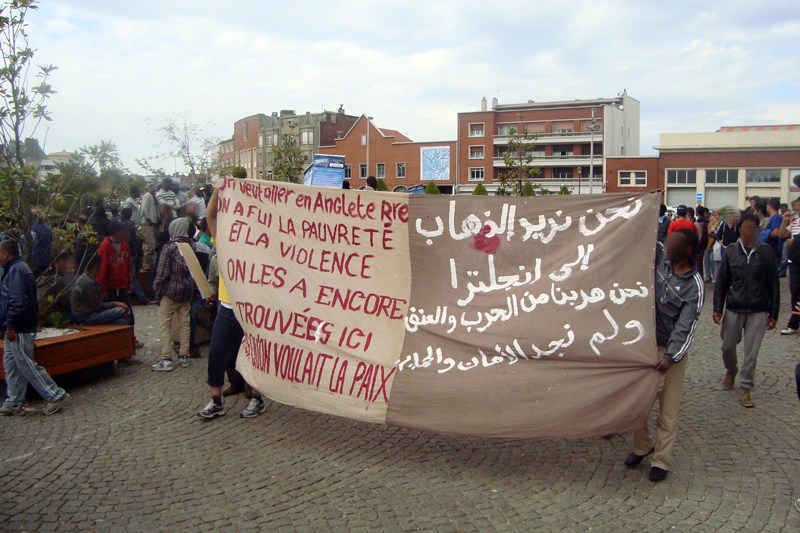 Big operations like this are often accompanied by targeted deportations as a method to clear Calais of migrants and refugees and incite fear into wider communities; so that more people leave and to ‘deter’ more people from coming; like the charter flights arranged for mass deportations of Afghans in 2009, or the attempted deportations of Sudanese during large eviction sweeps in 2012 and 2013.
repeated evictions. 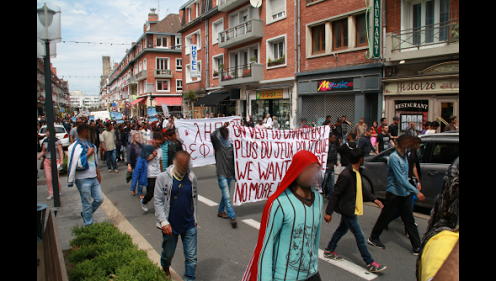 Many people moved to sleeping outside at SALAM in response to a large police operation on 28th May that saw hundreds of people evicted across three make-shift camps built up around the French port. 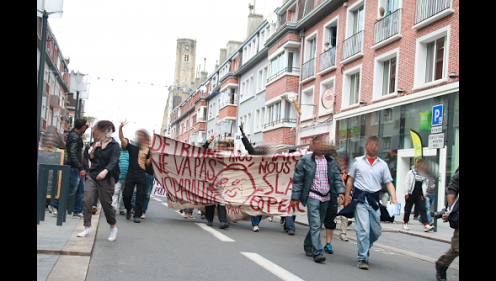 The latest eviction was authorized by a court order in Lille only days ago on June 27th. The Town Hall, under the direction of right-wing Mayor Natasha Bouchart who has spent many years hell-bent on trying to rid migrants from Calais, took the opportunity to move quickly to destroy the new camp. 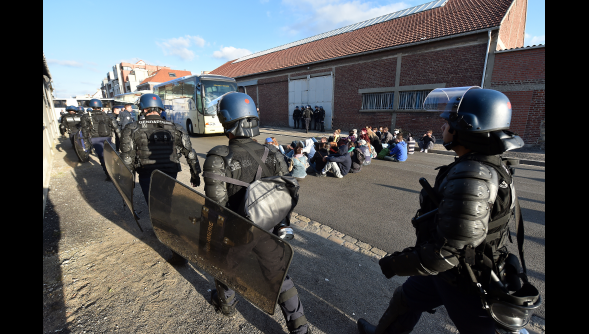 At least three people were arrested for ‘rebellion’ during the eviction; the president of SALAM, a member of the Auberge des Migrants and a person associated with No Borders. From the Sahara to the Mediterranean through to Calais, people who are not privileged with a legal way to pass have to risk their lives to cross borders. This year there has been at least eight known deaths as a result of the conditions of the Calais border. Lets be creative and in solidarity with the people in Calais, from wherever you are. If you cannot go to Calais, inform people, make flyers and banners, collect tents and send them with your friends to Calais! …and continue the daily fight againt these racist controls wherever you find them! 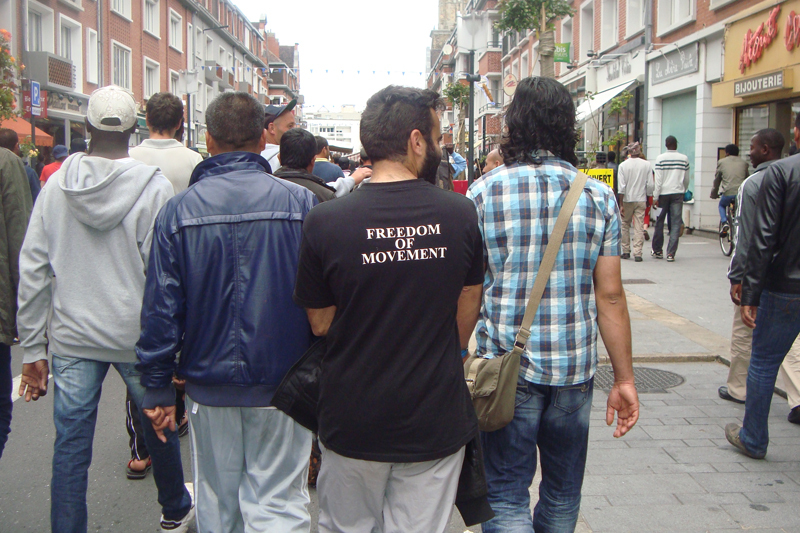 Free movement for all – the border regimes must fall! Since the destruction of the two camps on May 28th, ordered by the city, between 200 and 300 refugees have gathered together at the food distribution center, SALAM. They are refusing to disperse and demand that the authorities tell them where they can go to live in peace. For the first time in Calais, the Sudanese, Eritrean, Afghan and Syrian communities are all united, and for the first time the prefecture has sent a mediator to ‘negotiate’ with the migrants. But since the May 31st, the negotiator has not returned. The migrants are left in uncertainty. Can they remain at SALAM in peace or do they have to fear eviction in the coming days? The testimonies of police brutality against isolated people in other parts of the port don’t inspire anyone to leave the group. The list of demands drafted by representatives of each community were taken to the sub-prefecture on May 30th. 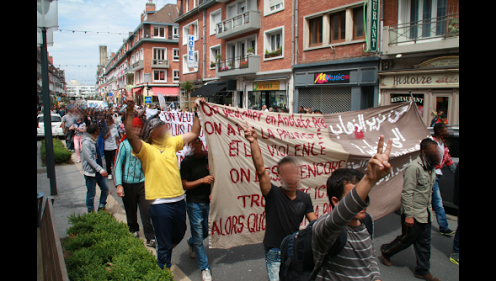 Faced with the silence of the authorities, the refugees living at SALAM decided to hold a demonstration in the streets of Calais last Saturday, June 7th, to call attention to their demands and call for the resumption of negotiations. A few stayed in the camp to keep watch, while more than 200 others, refugees of all nationalities and their supporters, marched toward the town center with drums, banners, signs and fliers to inform the populace. A communique with their demands. 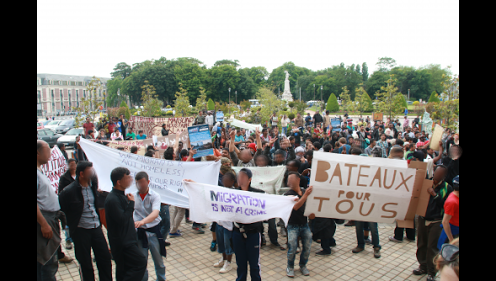 And another (in French) denouncing the town hall for evicting the camps just so the tourists who come for the maritime festival “Escale à Calais” [Port of Call Calais] don’t have to see the miserable living conditions of the refugees in Calais. The little fascists of ‘Sauvons Calais’ followed the demonstration from afar, but did not manage to disturb it. One of them stuck his arm out in a Nazi salute, only to take to his heels and run. Another drove by in a car, shouting “they all belong in the oven!”, right beneath the eyes of the police, who did nothing in response to his inflammatory, hateful comments. In general, passers-by reacted to the demonstration with goodwill and accepted the fliers. New supporters followed the group, which stopped for a moment in front of the town hall before continuing toward the theater and returning to the camp, two hours after they had left. If the authorities continue to ignore the united communities of the camp at SALAM, more demonstrations will certainly follow. Since the authorities are giving no more signs of life and making no further proposals as to where the refugees can stay, other than the food distribution center, the refugees are rekindling the debate with the following communique and planning a demonstration. We are the homeless migrants of Calais who have been occupying the food distribution center for the last week. All of the communities live there and have decided to unite to find a solution for our situation. We have tried to meet with authorities for this purpose, but they have broken their promises and have failed to respond to the demands we have made. We are homeless here and we want to be given the possibility of living dignified lives in safe places in Calais, where we can stay temporarily on our way to England. Why is it that we are in this situation? Who can help us to find a solution? We were living in poverty and war in our countries and now, we find ourselves once more in even worse poverty. The authorities told us at the beginning that we had less than 48 hours to vacate these premisses, or they would evict us by force, although we came here to flee violence. Is this just? 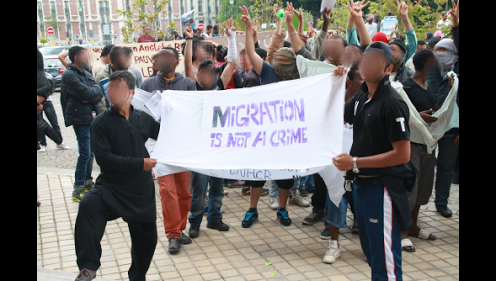 We want an end to the violence against migrants! We came here for freedom and that is what we are trying to find… we want to reconstruct our lives and not to die here slowly. We want to be given to be given the chance to live where we want! We request as well a meeting with the British government, with whom we would like to discuss our situation. We want to be heard! We are human beings, not animals! Negotiations between France and the United Kingdom to allow people access to British territory.